The 1925 dime value is at a minimum of $1.25 - rising because of the silver it contains. However these old Mercury dimes are avidly collected today and many are valued higher. 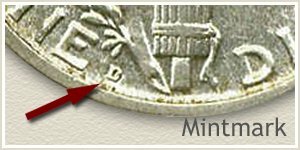 First, worth a premium are the elusive Denver minted dimes, they have the highest value of the three mints producing coins in 1925. Dimes struck at Philadelphia and San Francisco although not as valuable as the Denver coins are still popular when found in higher grades. Next, as you judge the condition of your old dimes it is possible to discover a coin worth far above silver value. There are many serious collectors of Mercury dimes, and in their search to add nicer dimes to their collections, are willing to pay higher prices. Highest values are reserved for coins in the best condition of survival. 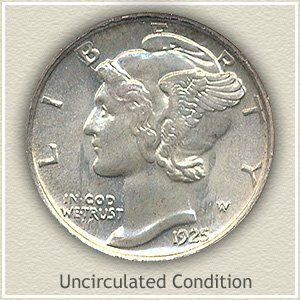 The "uncirculated" 1925 Mercury dime pictured is valued over $25 and would please any dealer or collector. The chart highlights these values and also the impact mintmarks have in determining how much your 1925 dime is worth. Three mints produced Mercury dimes in 1925. If this rare 1925-D Mercury dime were to come to auction today the final bid would be far higher than the $575 it sold for just a couple of years ago. A nice mix of pale gold and blues highlighted from underneath by the original bright silver is a pleasure. Also spared of excessive contact marks and abrasions, the choice condition of this coin is rarely found. Year after year high quality Mercury dimes post gains in value. 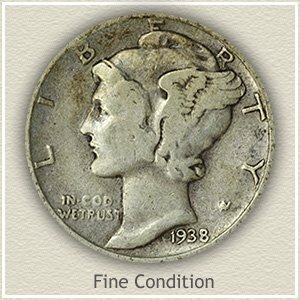 Growing numbers of discerning collectors are willing to pay strong prices when a seldom offered dime is auctioned. Today's popularity and demand is raising the values of your old Mercury dimes and the rest of your coins. 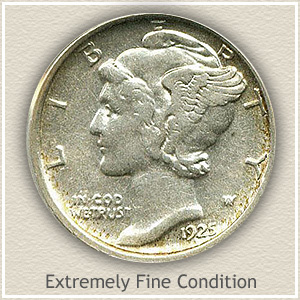 The chart shows the value of a 1925 dime in "extremely fine" condition is far higher than a coin in "good" condition. Collectors and dealers are always searching for the best quality, best preserved coins. They judge the condition of each and assign a "grade." 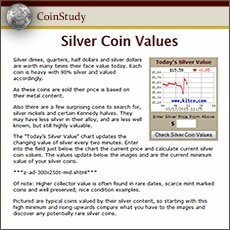 Comparing your coins to the images finds the accurate condition value on the chart. Extremely Fine: Although this coin has been in circulation, it sill remains very detailed in appearance. Across the surface a small amount of wear is visible. The feather details of the wing above Liberty's ear have worn and lost detail but remain separated. Also a slight flatness to the once rounded cheek is noticeable. On the reverse, all of the vertical lines of the "fasces" are separated. 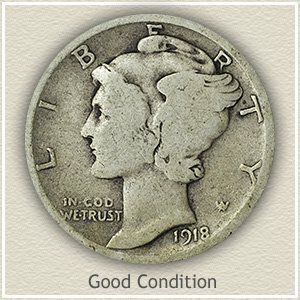 Your coin is a nice collectible condition with a premium 1925 dime value. 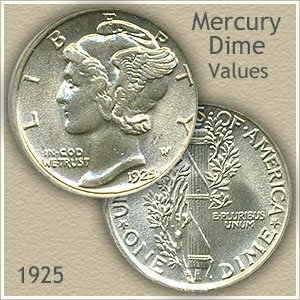 Values listed for the entire Mercury dime series including more on the 1925 dime value. Rare and valuable dates are scattered through out the series. Additionally, the condition of your old dime plays a key role in value. Coin Values Discovery... finds 1925 dime value and... all old US coin values. 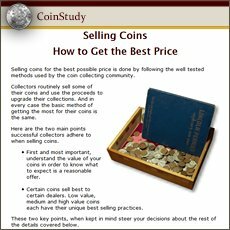 It is an excellent index, follow the images and text links to all coin series, from Cents to Gold. Value charts, alongside grading images to judge condition, determines how much your box of old coins is worth.